The taps are flowing and the packaged beers are available as well now at Southwest Grape and Grain. Our friends at Southwest Grape and Grain recently completed their growler-filling/pint-pouring (beer, while you shop for making more beer) station, with package sales as well so bombers and cans aplenty. I, Franz Solo, headed over and talked to owner Donavan Lane about what we can expect from this lovely development going forward and about the looming holiday season — it is an annual Crew favorite owing to the plethora of barrel-aged, barrel-aged, barrel-aged … yes … but that’s a dark tale for another ramble — and what that means for his fair establishment. Solo: Here we are, you’ve got all of your taps in place and pouring and beer for sale in the store. How cool is it seeing your vision for this space beginning to come to fruition? Donavan: It is definitely satisfying, a long time coming with the moving process earlier this year and the remodel, and the licensing, and then getting all of the taps set up has definitely taken a while and a lot of effort, but it is finally getting there. We’ve been selling beer for about a month and a half now. More people know that they can get a beer while they are shopping, so (it is) definitely nice to see it going. Solo: Any interesting future plans for what you might do with all of these taps? Donavan: Well, we have a few things to finish up in our brewing room. The goal is to try to get all of that done by the end of December, or the first part of January. We’ve been brewing a few little 5-gallon batches that we’ve put on tap, where we are having some fun playing around with recipes. Once we get the bigger system set up, we will be able to do bigger 1-to-2-barrel batches and put those on tap. And, then we will start looking at figuring out the logistics and price points to be able to start offering brew on premises, where customers can come in and brew a batch here and then split it up amongst friends, or take it all home for themselves. So during the first part of next year we will look into getting that going and then working with the various beer clubs in Albuquerque, whether it is Dark Side Brew Crew, the Worthogs, or the Dukes of Ale, or any of the other ones that are out there about doing collaboration beers, having them come in a brew a beer that we put on tap, doing some competitions with the clubs, as well. Definitely a lot of fun stuff there. As far as the growler fill goes, we are continuing to reach out to more and more of the local breweries to get more of their packaged beer in. Our taps are basically full, but those will continue to rotate. Whenever one goes out we will bring in something new. (Between procuring grains and such for my own batches and trying all of the many special/seasonal offerings on tap, I may never leave, well, unless it involves other actual beer-related work.) We are also going to look into bringing in some local wine as well. You can take home packaged beer in addition to supplies to make your own beer now. So all told, this is pretty great out the gate in concept and execution, with a lovely swath of unique offerings from our favorite local haunts on tap, ready to fill your growlers or slake your thirst while you browse the many fermentation-related necessities on site. Grape and Grain has a patio available for beverage consumption as well, but as it is nearing full winter this will not be open until spring, when the brewing room will hopefully be in full swing. Also of note are a few holiday sales going on this month and throughout the holidays, so here are the details on those for all of your fermentation/homebrewing needs, or gifts for your friends or loved ones who have fallen for the craft. From now through December 14 there is a raffle going on with an entry for each pint purchased and some very cool prizes being offered to boot. Black Friday sale: 10 percent off Friday and Saturday, and a coupon for 20 percent off one item on Sunday with coupon from Facebook or store email list (I definitely recommend getting on this list for other perks, which I have most certainly taken advantage of in my three-plus years of homebrewing). Coming in December, an all-grain sale on the first 25-percent all-grain by the pound or 10 percent off bulk bags. There will also be some sales going on closer to Christmas and New Years as well, but those are still TBA. On that note, I bid you all happy brewing, happy shopping, happy drinking, happy festivities, and so on an so forth! There are a whole lot of Oktoberfest-style beers on tap around the metro area right now. A whopping five more Oktoberfest-style beers went on tap in the Albuquerque metro area last week, joining multiple marzens that have already been on tap for a while. With so many wonderful lagers available, I just had to get out there and try as many as possible. My plan totally worked for two days, until a combination of sports (NHL openers and MLB playoffs mostly) and the need to watch season three of The Expanse caused me to fall behind. One of these years I will get to them all. Anyway, my first three stops were Sidetrack, Boese Brothers, and Marble. I rather enjoyed Sidetrack’s offering, which did not overdo the sweetness. It was a solid, crushable beer, befitting the laid-back atmosphere of the pub. The Boese Brothers offering had been on tap for a while now. It did not quite have the flavor impact I had hoped for, but age may have been a factor. As for Marble, it was less of a marzen and more of a straight German lager. It is still a quality beer, as one would expect from brewmaster Josh Trujillo. I also got to try the Kottbusser collaboration beer, which was sweet yet bready, and the Jimmy Bock, a chewy little tribute to Shiner Bock. Day two of the Oktober-quest took me to Toltec for lunch a pint of another tasty offering. I would like to try it side-by-side with Sidetrack, as both had many of the same tasty qualities. My final stop was at Bosque on the way home. Again, it was a bit lighter lager than the more copper-colored marzens of yore, but it was again a clean, balanced beer. A few years ago, the Oktoberfests had almost disappeared from taps in favor of the pumpkin beer fad, but thankfully that passed and now we are blessed with multiple marzens and lagers. What is your favorite Oktoberfest on tap this fall? Yes, you can still include some from a few weeks back, like Santa Fe and La Cumbre. Now for the rest of the Crew’s adventures from the past weekend. Somebody has a new home on Candelaria, not far from La Cumbre! For anyone that was still unaware, Southwest Grape and Grain has moved to a new home at 3401 Candelaria Blvd NE on the north side of the street just west of Carlisle. As the Crew’s main home brewer at this point, I, Franz Solo, headed over to meet with owner Donavan Lane to get a tour of the new space, and gain some sense of what he has planned going forward. We first took a look at the main sales floor. Donavan: Kind of the same setup as before, a little bit more space up here. It is amazing how much of a difference a few hundred square feet makes. I mean, we had maybe only 400 square feet of additional space in the showroom area compared to the old location, but it makes a huge difference. Solo: That it does, because you actually have space around the counter. You’ve got easy access to all of the different sections which are all easier to see. A definite improvement to the shopping experience, in my opinion. Donavan: Yeah, this will allow us to look at maybe some other products to bring in, and we have more than enough floor space where if we need to add in another shelf or two we can definitely do that. So we will be looking at that in the next couple of months, some other possible products to carry. The grain room is pretty much the same setup we had at the other shop. Solo: Yeah, visible, it’s not tucked around the corner in the back. Donavan: Especially for our existing customer base who have been brewing for a long time and coming to us, they knew to go down the hall at the old shop and the grain room is right there. But, for new customers they would walk in and they would never even know this was part of the store, and just having the display bins with all of the different malts it’s just cool looking. So when we designed the space I knew I wanted windows, I wanted this to be visible. The nice thing is that this is kind of a focal point of the store now which is great. Southwest Grape and Grain now has a dedicated classroom space. As some of you may remember from brewing classes offered at the old location, they were held kind of in the middle of everything. I’m glad to say that Grape and Grain now has a dedicated classroom area off of the main floor. We talked a little bit about plans for this space now and in the future. Donavan: So since we have this space designated as a classroom, I mean we are looking to expand our offering of classes, try to team up with more people on that. I’ve been talking to Brian (Langwell, of Left Turn Distillery) for probably an entire year that we ought to set up a distilling class and things like that. I have a friend who does one of those paint and wine class things, so we will probably look at setting up and doing those here. Solo: I mean it is a great space for it. Donavan: Any other classes we can offer to utilize this space will be something we have in mind. The future brewing room and growler fill stations are in the back corner. New and forthcoming additions to the shop will include a growler-filling station and dedicated brewing area for brewing on site, which is awesome all around. Donavan: We have our walk-in cooler and our growler-fill station, the intent of it kind of is to brew a few of our own beers, which we will put on tap more as demonstrations than anything. The idea being that if you want to make an IPA or something, here’s one on tap and here are all of the ingredients in a box kind of a thing. Solo: Yeah, make it and see how yours turns out and then you can learn something and have fun doing it. Donavan: We eventually plan on putting 20 taps of all of the different local breweries. If a customer wants a pint while they are shopping, that’s great. Overall, however, the focus will be on growler fills, get your homebrew ingredients, get your local beer, and take it home to enjoy while you are brewing. This will eventually be our brewing room once we get it finished out the rest of the way. I still have a little 2-barrel system that I had at Broken Bottle, so we are going to set it up and then bring in a few small 1-barrel fermenters and start offering brew on premises. We are looking to do collaborations with Worthogs, Dukes of Ale, with you guys, and so on. Ariel (Figueroa, of Worthogs and a good friend of ours) and I have talked about maybe doing another Battle of the Beer Geeks type of thing, doing another little kind of twist on that with all of the different beer-related clubs in town. Make sure to get some reading materials. Solo: Sounds great to me, the more brewing the better. Donavan: We are still waiting, though. We haven’t yet officially submitted our (small brewer) license yet. I’ve got it almost completely done, but the last couple of months with trying to finish up the remodel here and plan the move and everything. Solo: Yeah, you’ve had enough on your plate. Donavan: It finally just got to the point where I was trying to get it done in the evenings and stuff. Eventually, I had to just put it on the back burner for the time being, get the move done and then finalize it when everything else was all done. Hopefully sooner rather than later we will get it all taken care of and be able to start utilizing this brewing space and get the growler station going. Solo: It’ll be fun for sure. It’s cool seeing this coming to reality having talked to you, what was it, over a year ago? Donavan: Yeah, when I bought the shop from Kevin (Davis). It took a lot of planning and between finding the right building and getting a landlord that was willing to work with you and all of the different stuff involved there. But yeah, it’s finally done. Well, mostly done. The hops and yeast fridges made their way to the new location. Solo: You have all of the main stuff tackled. Donavan: The rest of the stuff is pretty much kind of the same. We tried to keep the same sort of layout and flow of it as close as we could to the other shop. You’ve got your hop fridge, your yeast fridge, your DME and LME, and all of that stuff together, your equipment and kits and stuff all together. So that it is the best possible flow we could create for the layout at this point. Of course, as time goes on we will refine placement of items and such, but the basic idea is already in place. The other longer-term thing is that when we get our brewer’s license, we had it put in the lease (that) this outdoor space is ours to utilize. So we are going to put a few chairs and tables out here in this little patio space where you will be able to sit out(side) and have a beer if you want to. Saturday at the grand opening for national homebrew day we had everyone out here where it was the perfect space for everyone to set up and do their brewing demos. Our focus isn’t to try to be a brewery or a taproom or a bar, but to try to bring a little bit of that into the shop is what we had in mind, something of the whole beer experience in one place. If La Cumbre is packed on a weekend and you were on your bike, you can just come over and have a beer here, or once people know that we are doing this you can come down and get three different growlers from three different breweries all in one place. Solo: Don’t have to drive all around town to get multiple fills which is quite convenient. Awesome. Donavan: It’s been a long couple of months, but it’s mostly all done. Solo: Hey, you’ve got it man, you’re here. The grain room is so much more open now. So for all of you homebrewers out there, head over to the relocated Southwest Grape and Grain and check it out for all of your brewing needs. We will keep you posted as well with any updates to the brewer license/growler station as they come our way. Until next time, I bid you happy brewing and Skål! Take the biggest brewery in town, add in some homebrew clubs and a shop, a couple food vendors, and then toss in the most interactive museum in town, and voila, the Science of Beer is back! Explora Science Center will be hosting this annual event in partnership with Marble Brewery on Friday from 7 to 11 p.m. The Dukes of Ale, Worthogs, and Southwest Grape & Grain will also be on hand to help educate everyone, from the novice to the expert, on all things beer. Ticktest cost $12 for Explora members and $15 for everyone else. There may still be some available online, with the last 100 going on sale at Explora on Friday morning. The event sold out last year, so get them now if you want to go. To get a little more detail, I caught up with Marble’s (very busy) off-site events and festival coordinator, Tammy Lovato, on Wednesday night after the Bites & Brews Challenge wrapped up at the Heights taproom. Marble staffers will host a series of special presentations throughout the night. Head brewer John Heine, brewer Jeff Priddy, lab director Stephanie Crownover, and packaging manager Nate Jackson will be among those on hand. In addition to Marble, the Dukes of Ale, Worthogs, and Southwest Grape & Grain will be doing live presentations on different aspects in the art and science of homebrewing. Those will include some live experiments and hands-on fun for the crowd. Marble also will be providing the beer that will be poured at the event, lest anyone go thirsty. After an outcry last year for more beer, the brewery staff will step up. “This year we have five beer stations instead of three,” Tammy said. “We sell 900 tickets, so we’ve doing five different stations so we can service more people, get people in and out quicker. We’ll have two that are cash-in-hand only. That will hopefully get people through the lines pretty quickly. Bringing cash instead of relying on credit cards is recommended for all stations to keep things flowing. There will also be food on hand courtesy of M’Tucci’s Italian and Malaguena’s Latin Tapas. The best part of this entire event is how it all helps the museum. Go get your beer education this Friday. And for the record, yes, that Caffe Roggenbier that I was drinking was quite good. Greetings, craft beer fans! This one’s for all the homebrewers out there, and, of course, any and all folks interested in learning more about beer. If you haven’t already heard, National Homebrew Day is fast approaching, and we don’t want you to miss out on any events here in New Mexico. This year, on Saturday, May 6, large homebrew events will be held across the nation, and you can find them all on the AHA Website. And, because we’re just as serious about beer here in our state, we have a few events planned for you, New Mexican Brewquenos, as well. Milton’s Cavern City Big Brew Day (brewery) – “Come hang out with the local homebrew club, Cavern City Brewers at Milton’s Brewing. A number of homebrewers will have their personal brewing systems in the outdoor area of the brewery demonstrating a homebrewer’s brew session.” Contact Brad Carlsen at caverncitybrewers@gmail.com to RSVP. Location: 108 E. Mermod, Carlsbad, NM. Santa Fe Brewing Company (brewery) – “We will be hosting 2017 Big Brew in the brewery. Please come out to join us. RSVP to the email address so we can buy enough food for people.” Contact Ted Bolleter at jtbolleter@yahoo.com to RSVP. Location: 35 Fire Place, Santa Fe, NM. Southwest Grape & Grain and Worthogs Homebrew Club (homebrew supply shop) – “Homebrewers from the Worthogs Homebrew Club of NM will be brewing some All- Grain, Extract and BIAB recipes at Southwest Grape & Grain homebrew shop. They will be ready and eager to talk to anyone interested in learning how to brew, answer questions, and share their experiences. This event will run from 10 a.m. to 5 p.m. For more information, call 505-332-2739 (SWGG) or 505-289-0123 (Worthogs).” Contact Donavan Lane/Ariel Figueroa at worthogsNM@gmail.com to RSVP. Location: 2801-N Eubank Blvd NE, Albuquerque, NM. Victors Home Brew (homebrew supply shop) – “We will have home brewers out on the porch brewing with their different types of equipment and eager to talk to anyone interested in learning to brew, answer questions, and share stories. Dukes of Ale brew club members will be participating and offering presentations on making mead, cider, and different kinds of brewing equipment. The event will run from 10 (a.m.) to 4 (p.m.). Come have samples, pizza, and refreshments. Call 505-883-0000 for more information.” Contact Jens Deichmann at jens@victorshomebrew.com to RSVP. Location: 2436 San Mateo Pl. NE, Albuquerque, NM. To RSVP directly and for additional details for these events, just click this LINK! Do it! From co-owner/head brewer Lucas Middleton: “This Saturday, Cavern City Brewers will be participating in the American Homebrewers Big Brew 2017 at Milton’s brewing on the patio (out back). We will be opening at 2 p.m. for locals to come and check out the brewing process and get the word out about the Homebrew club. “The Friday before (May 5), Tractor is coming down to supply us with a new beer called Minute-4, a smoked lager they brewed for the firefighters in Carlsbad. We will be donating proceeds from this beer to help the team out. This year, on Saturday, May 6, beginning at 9:30 a.m., Santa Fe Brewing Company will once again host Big Brew with, well, a big brew session in their big brewery. Santa Fe’s fine homebrew club, the Sangre De Cristo Craft Brewers homebrew club, will be there to talk beer, brewing, and the craft of craft-beermanship. Food will be provided to those who RSVP, and SFBC R&D manager, David Ahern-Seronde (of current Santa Fe Reporter cover page fame) will be offering tours of the entire grounds, including the new packaging hall, barrel cave, and The Bridge. It’s sure to be a rockin’ good time, so RSVP now. Before SFBC had nixed the event in 2016, I had been to a couple Big Brews in the past before writing for the NMDSBC. It is actually at one of these, where I met with the Sangres, learned a thing or two about how to brew, and got started homebrewing, which expanded on my passion for craft beer as well as brewing industry network, which eventually landed me this sweet writing gig. So, folks, homebrewing, not fear, was the path to the Dark Side for me. What to know: Santa Fe Brewing will provide hot and cold liquor for brewing. Food will be handled by the Sangre De Cristo Craft Brewers, that is, if you RSVP. What to bring: Bring all your equipment! If you’re not feeling like bringing out the whole rig for an all-grain brew, then that’s fine, too. Feel free to do an extract brew, and just come out and have a good time. If you’re not sure what all-grain or extract brews are, then you could definitely benefit from coming out to Big Brew! Peaches for the brew, SFBC 2015. 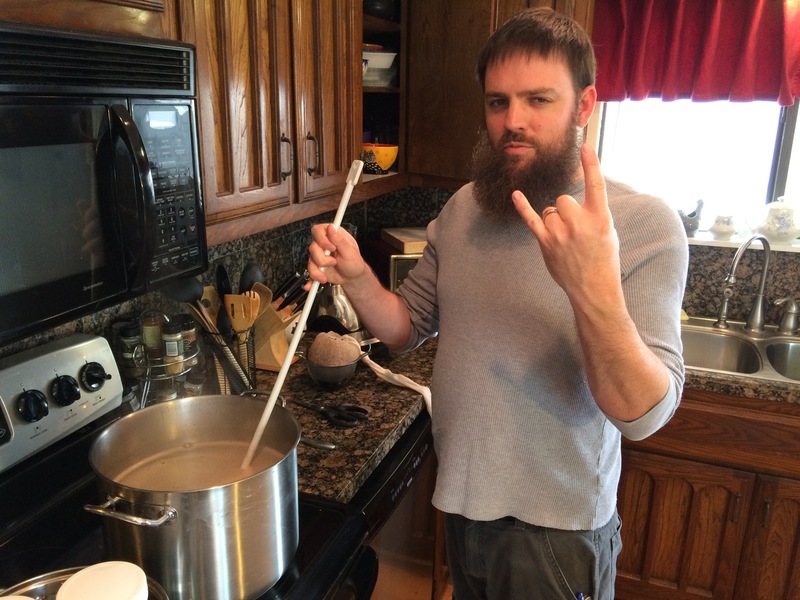 Homebrewing is a great gateway into the craft beer industry. 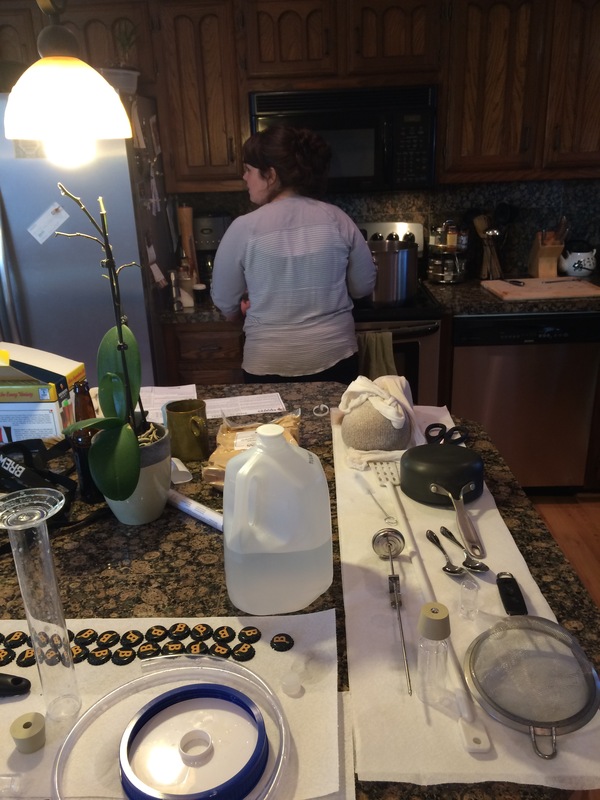 Homebrewing channels passion, fosters creativity, and maybe above all, teaches technique. At the top level, homebrewing has even led many folks in the state to open up their own facilities, where you currently enjoy a hand-crafted experience, and at its lowest level of achievement, homebrewing teaches a much better understanding and appreciation for that carbonated beverage we love so much. I highly recommend going to any of these special events, even if you don’t plan to brew, or to take up homebrewing. You’ll get to talk homebrewers about DIY projects of the beer-related kind, and also you’ll get to speak with pro brewers about their favorite thing to chat about, and I’ll give you a hint — it’s not distribution and licensing. You can ask them all you want about making the good stuff. So, I hope you go out, and maybe one of you will decide to learn to homebrew after this weekend, and maybe one of you will achieve greatness and open up the brewery that turns the New Mexico brewing industry upside down, all because you stopped in to check things out on a Saturday. Who knows? Hope you can make it out to one of the events! And, remember folks, fear might lead to anger. Anger might lead to hate. Hate usually leads to suffering. But, the Dark Side Brew Crew will always lead you to beer. 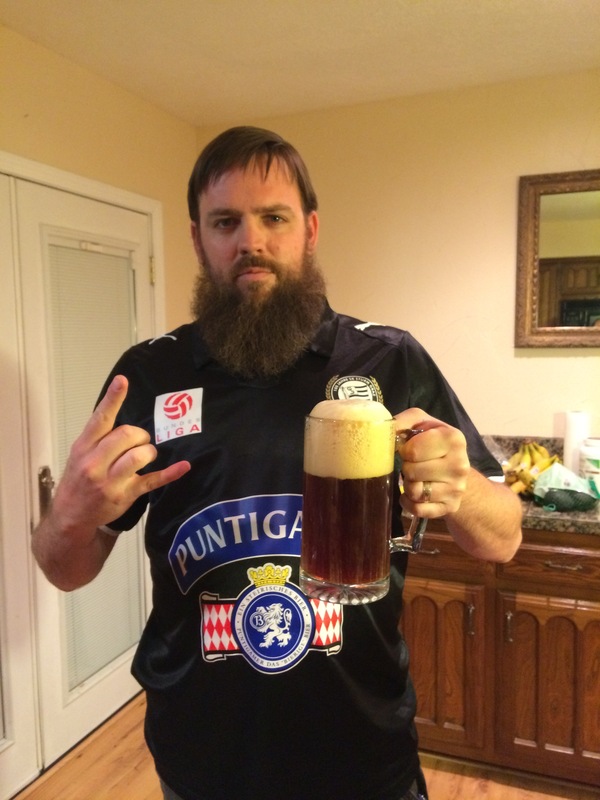 For more #CraftBeer news, @nmdarksidebc info, and Untappd Badge-whoring, follow me on Twitter @santafecraftbro! Yup, we have another home brewer in the Crew. From a wish to an idea to the bottled goodness we call beer, this is my tale concerning how I became a home brewer and the adventures I’ve had along the way. Twenty years ago I was in my parents’ home wondering what in the blazes was this odd aroma coming from the kitchen. My father, who has quite the penchant for making things, fixing things, cooking things, growing things all himself, was brewing beer. I recall bottling with him on a fair number of occasions around this time and perhaps a taste or two for my own curiosity. Fast forward to the beginning of 2015. My wonderful wife had procured a three-gallon stainless steel stock pot for me some months back and I had made quite a few different turkey and chicken broths therein. It dawned on me that I ought to try brewing my own beer since I have a natural proclivity for cooking and enjoy doing so. With advice from the rest of the Brew Crew and a few other brewers I know, I went with Porter Pounder to Southwest Grape and Grain and procured the necessary equipment for brewing. As it turns out, for the basics of doing extract brewing you can purchase all of the necessary items for around $200, including your first batch. The dunkelweizen in its infancy. 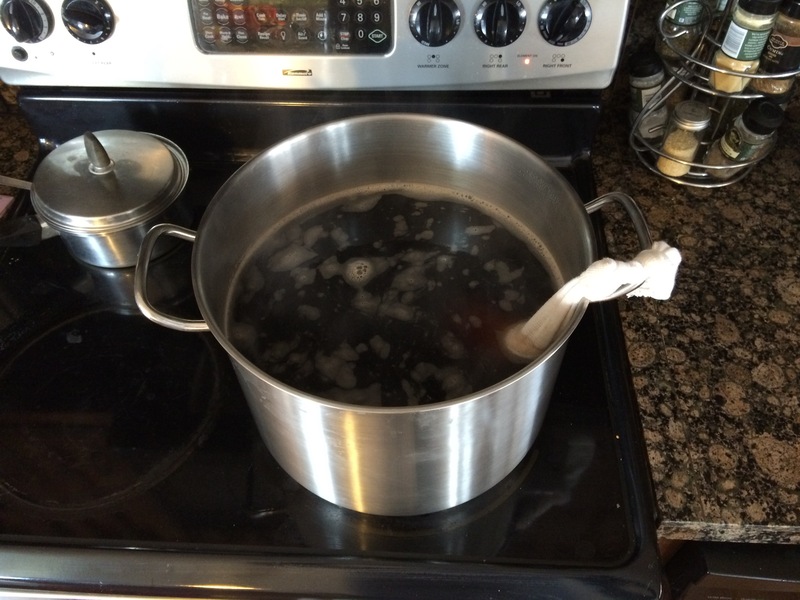 In honor of my German heritage (among many others), I chose to do a dunkelweizen for my first batch. 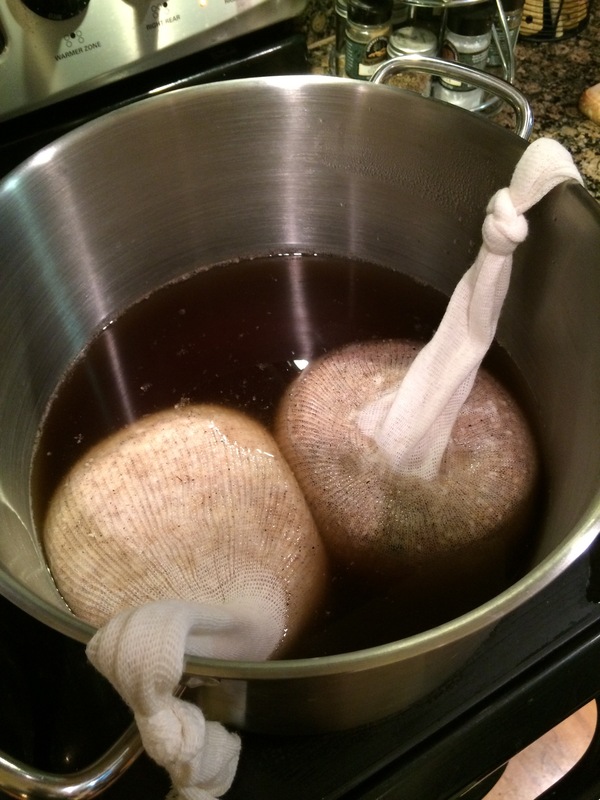 The excitement of brewing my first batch was just outstanding, and the resulting beer, which turned out better than I imagined, is a testament to what I learned from Porter Pounder and others alike. Just a wee bit of grain for the oatmeal stout. The second batch was an oatmeal stout into which I added cold-brewed coffee. This one taught me a few lessons about stouts and yeast strains. Mrs. Solo and I followed the kit instructions to the letter and were surprised at the light color of the beer. This was compounded when the brew crashed early and needed a second yeast pitch and a heater (this was in March) to get to the target gravity. One suggestion I received was to steep my grains for longer than the suggested time by about two fold for dark brews and by about half for lighter brews to get maximum flavor and proper color when using extract primarily and only a portion of grain. Having tried this out, it is definitely helpful if one is brewing extract as my later brews have turned out better and better. All the equipment one needs for brewing and bottling. On the topic of yeasts, be sure to check what temperature range your yeast likes before pitching as that will help to avoid early crashes such as I experienced. The most important things I learned from these first two batches were cleanliness is godliness (so far I haven’t had a single contaminated batch), knowing the sweet spot on your stove or burner is paramount, knowing which styles demand racking for clarity, and being open to experimentation since that’s where you make a beer your own. Upon victory, drink thine own beer, listen to metal, celebrate.